Trained in epic literature as Performance Storytelling, Vayu writes, lives in and loves London. 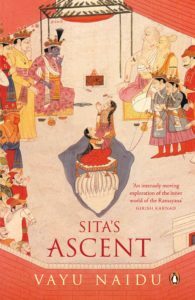 When she was appointed the first ‘Sage in Residence’ at Eton College working on heroism across epic literatures, she completed her first novel Sita’s Ascent (Penguin India: 2013). It was launched at Jaipur Literature Festival, India. This novel is a reimagining of the circumstances and resilience about an iconic woman, twice exiled. It was nominated for the Commonwealth Book Award. Her storytelling – written and oral – spans diaspora urban, epic, folk and tribal stories inspired from multiple literary and street sources. Cultural binaries immersing characters in challenging landscapes, meta texts, while speaking across historical and national borders is a strong feature of her writing. 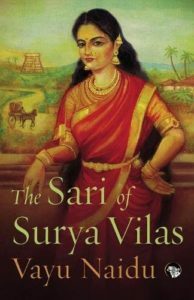 Her second novel The Sari of Surya Vilas (Speaking Tiger-India, Affirmpress- Australia: 2017) is historical fiction set in the Madras Presidency from 1857-1916 and Norfolk, England. The silenced stories woven in a wedding sari, and the emergence of the Oxford Dictionary is symbolic of freedom through woven story and language as identity. The novel was featured in Australia’s ABC Broadcast as Book of the week. She is a Literature Festival enthusiast and has chaired many panels promoting emerging writers at Jaipur Lit. Fest, Byron Writers Festival, British Library among others. She has written for British Theatre, BBC Radio Drama, and tours internationally as a Performance Storyteller. Her work is archived in the SADAA website. Her PhD (Leeds) and AHRC Post-Doctoral Fellowship (Kent) enabled academic research and Apprenticeships in Intercultural Storytelling validating oral traditions. She received the Humanities Teaching Award University of Kent, for enabling students in participatory work with Refugees at Margate and donated it to Tsunami survivors working with the Fishing community in Tamil Nadu. Her work in category A Prisons, with women emerging from domestic violence, and young people has strengthened her belief in the transformative capacity of the Word and the Arts. Vayu Naidu Intercultural Storytelling Theatre, an Arts Council England RFO enabled new writing and International touring. She is now Royal Literary Fund Fellow at UWL, and a Research Associate at CCLPS- SOAS, and a Fellow of the Royal Asiatic Society. She volunteers at Chelsea Physic Garden as well as THRIVE, a horticultural therapy Charity. 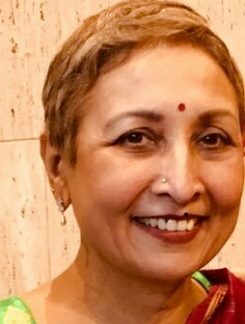 She is Director of THE WRITE PLACE, in December 2019 – leading Storytelling and Writing Residencies in location for historical fiction and non-fiction, touring the listed, UNESCO rock-cut shore temples of Mamallapuram, by the Bay of Bengal, Chennai India. September 2019 :She is also leading the Himalayan Echoes Festival’s Writing Retreat at Abbotsford in Nainital, India. The Royal Society of Arts has invited her as Speaker on the impact of Storytelling in Business and the Arts for National Storytelling Week, 2019 on her work with corporates. Her forthcoming third novel is set in the realms of transition when England sends out its first Ambassador to the court of the Great Mughal in India’s seventeenth century, and how the East was won. Vayu Naidu is seeking a British Agent – 007 need not apply.